My father shares the 25 August birthday with Bavaria’s much-loved king, and so my parents often have get-togethers on the evening of the 24th. They kick off with a late-afternoon cookout, and invite friends over for a viewing as the surrounding mountain tops are illuminated with symbols to remember the king. The year Shawn and I were able to attend the shindig, my mom had incorporated Bavarian flair into the otherwise American cookout: namely blue & white linens reminiscent of the Bavarian flag, and finger food appropriately fashioned into the shape of a crown, using a cookie cutter that would please any royal. The focal point of the Ludwigsfeuer is the Kofel, Oberammergau’s distinctive mountain, which bears a slight resemblance to Switzerland’s more massive Matterhorn. Atop the Kofel, male ‘fire-makers’ (Feuermachers) construct a 14-meter-tall wooden crown. On the Kofel’s slopes below, these men also craft a cross out of timber. And on surrounding mountaintops overlooking this valley in the Ammergau Alps, they create the abbreviation ‘L II’, short for King Ludwig the II. The Feuermachers are all locals, and many of them are descendants of past fire-makers. In all, there are about 90 of them. Preparation for the Ludwigsfeuer begins month in advance, with wood being carefully cut, set out to dry, and eventually lugged up to the Kofel’s 1342-meter peak, and to other neighboring mountain peaks. Around nine in the evening on the 24th of August, shots from a gun salute echo through the valley, and shortly thereafter the crown and cross are set ablaze. Occasionally, a bit of yodeling can be heard. And as the fire devours the wooden symbols throughout the valley, a traditional brass band plays Bavarian music. The band eventually wraps up with the Bavarian anthem. Once down in the village, still with their torches in hand, the fire makers join town residents and walk in a procession through Oberammergau’s main streets. The brass band members, along with drummers, provide a soundtrack for the spectacle, and eventually the participants celebrate in pubs until the wee hours of the night. To international visitors, King Ludwig is perhaps best known as the builder of the Neuschwanstein Castle (after which the Disney castle was modeled), and Linderhof Palace, an elegant structure of smaller proportions than its more famous counterpart. King Ludwig had close ties with Oberammergau, likely because Schloss Linderhof is only a few kilometers away. In 1871, King Ludwig also attended a special performance of Oberammergau’s world-famous Passion Play, an event that inspired him to donate a marble crucifixion monument to the town. At 12 meters tall, it was initially the tallest stone monument of its kind. Weighing 58 tons, the sculpture’s transport presented logistical challenges; several laborers were even killed while moving it through the rugged mountains. This Crucifixion Monument (known locally as the Kreuzigungsgruppe) was inaugurated in October 1875, with a fiery unveiling. It’s believed that the King Ludwig Bonfire that continues to this day has its origins in that event. 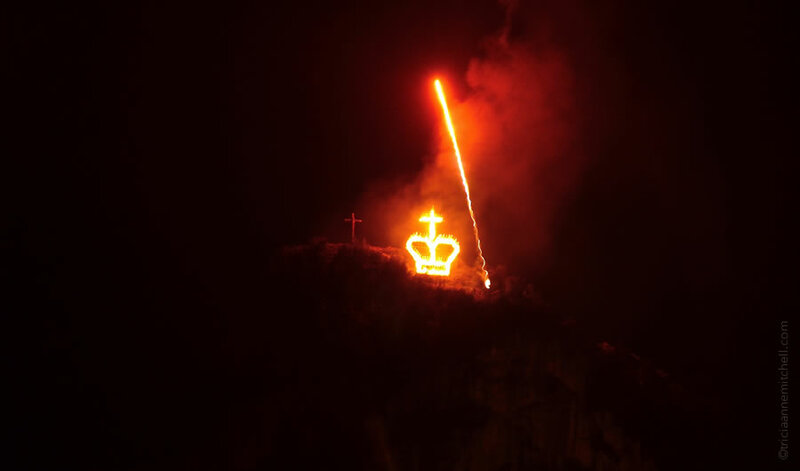 After King Ludwig’s mysterious death in 1888, several Oberammergau residents lit a fiery memorial on the Kofel to honor the dead king. A bonfire has taken place annually since then, with the exception of several years when dry weather conditions would have made such a spectacle dangerous. The bonfire’s now-signature crown was not added to the spectacle until 1946. Mount Kofel, looking majestic by day. We made the ascent to its summit back in the summer of 2013. Having found the last part of the climb a bit treacherous, I can’t imagine doing it in the dark! On the Osterbichl Mountain (just to the right of the church steeple in the photo on the left) is the Crucifixion Monument. 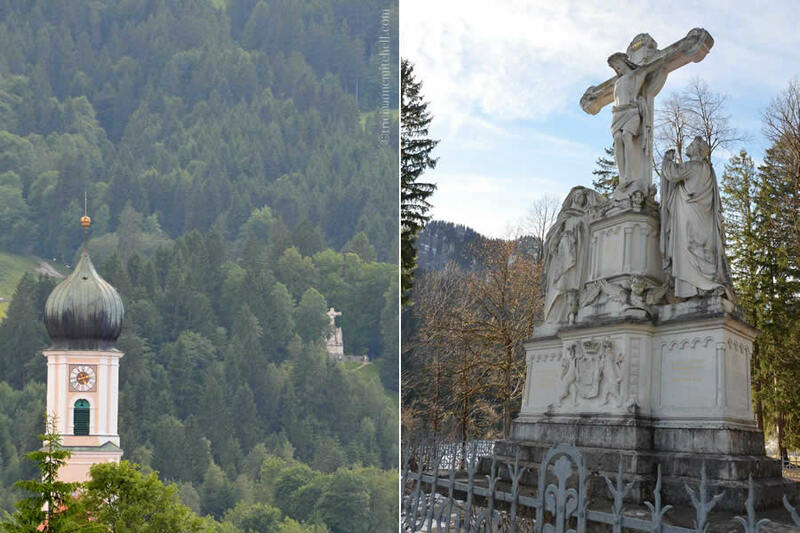 The marble statue (right) was donated to the town of Oberammergau by King Ludwig II, as a way of expressing his thanks for a Passion Play performance the town held in his honor in 1871. The statue was unveiled in 1875. At the time, it was the largest statue of its kind, weighing 58 tons! 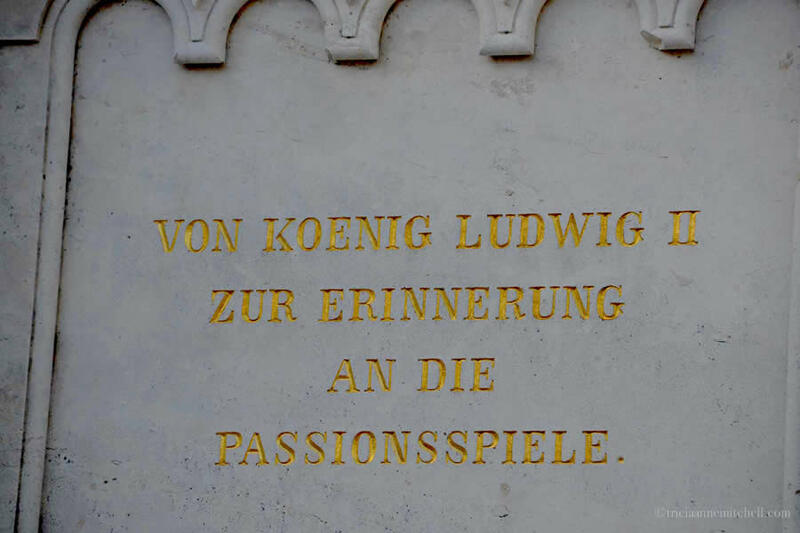 An inscription on the statue reads, “From King Ludwig II, in memory of the Passion Play”. The Bavarian monarch attended a special performance of the play in 1871. The inhabitants of Oberammergau have held the Christian play depicting the life and death of Jesus since 1634. One year earlier, the residents made the pledge to do so regularly, if God spared them from the devastating Bubonic Plague that was devastating parts of Europe. 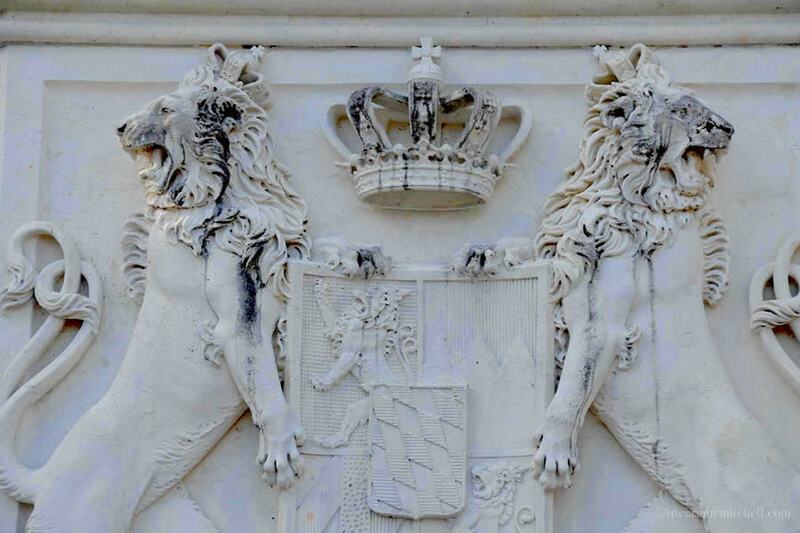 This detail on the Crucifixion Monument is similar to King Ludwig’s coat of arms at the entrance to the Neuschwanstein Castle. A troupe of Feuermachers (fire-makers) make their way down the mountain, creating a snake-like pattern. After the bonfire on the valley’s mountaintops, the fire-makers and Oberammergau residents make their way through the town’s main streets, accompanied by the tunes of a brass band and drummers. It’s a festive evening, with many locals hosting friends and family members at relaxed get-togethers. The König-Ludwig-Feuer, or Ludwigsfeuer for short, is held in Oberammergau annually on 24 August, the eve of King Ludwig’s birthday. 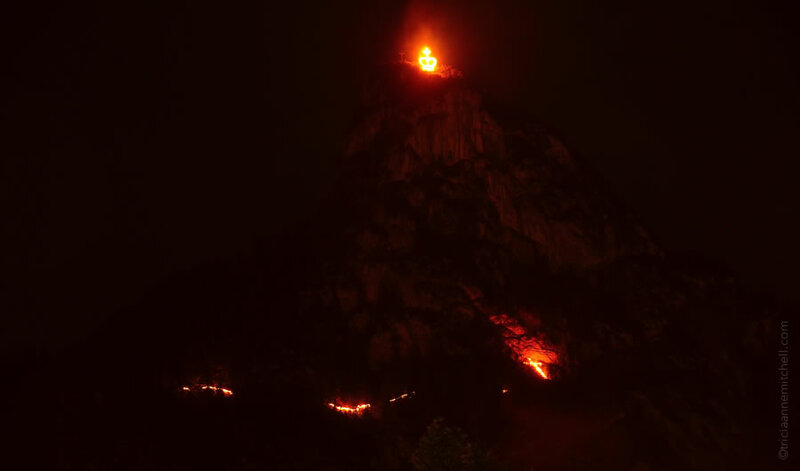 For details about the upcoming fiery event, refer to the Ammergau Alps website. I’ve heard that many visitors to Munich embark on organized tours for the spectacle – perhaps even staying overnight in Oberammergau. I haven’t personally done so since my parents live in Oberammergau. The following page indexes all my posts from Germany, including visits to King Ludwig’s Neuschwanstein Castle and Schloss Linderhof. Kamal, thank you for your kind words. Indeed, I’ve gotten a chance to get to know Oberammergau better, since my parents call it home now. It’s a wonderfully relaxing place to be: fresh air, stunning landscapes, and fun traditional events, such as this one. I regret we’ll miss tonight’s bonfire, but I’m keeping my fingers crossed for good weather. Hope you had a lovely weekend! This is amazing. It must be quite something to see. My husband also shares a birthday with your father and King Ludwig II, August 25! Darlene, what a coincidence about the birthdays! On a whimsical note, the Ukrainian veterinarian who tended to our former foster kitten, Cocoa, estimated that Cocoa’s birthday is 25 August. Cocoa’s new owner’s parent has a 25 August birthday too. This is fresh on my mind since we’ve just visited Cocoa the Cat and his wonderful family in Switzerland’s Italian-speaking canton of Ticino. More on that visit to come soon, but suffice it to say that Cocoa has grown into a stunning, loving cat, and he is living the good life. Wishing your husband a happy birthday in a few days! So happy to hear that Cocoa is doing well. So nice you got to visit him. August 25 is a very special day indeed. I enjoyed this post so much. Hope the weather will be good for the celebrations this year. Pictures are spectacular. Wow! Never even heard of this. Thanks for sharing! Dear Tricia, as an “old” Bavarian, I enjoyed this post so much, as I have never heard of the Koenig-Ludwig-Feuer, so I am learning now from you. Maybe I have been gone from Germany for too long to know about such local events. In three weeks I’ll be going to Munich for a short trip for the wedding of one of my nieces, celebrated in the country site of Munich. My trip includes a stop over in Stockholm for 2 days. All very exciting. I do hope to get to Garmisch/Burgrain for a day visit my cousin, as my 103 year old aunt, had passed away, on August 8th, she left peacefully and is relieved from all discomfort. She meant so much for me when I was young and still does. Enjoy the beauty of the Alps around you. Cornelia, first, I’m very sorry to learn of your aunt’s passing, as in the past, you’d mentioned how special she was to you. May you continue to have fond memories of your time together. As for the Ludwigsfeuer, I’m happy to hear that you enjoyed this piece about it! Until my parents moved to Oberammergau, I’d never heard of this bonfire, which is steeped in so much tradition. Perhaps some 24 August, you’ll be in Bavaria and able to find a special spot in Oberammergau (my parents’ home, even) to watch it! Tricia, thank you so much for your comforting words. Unfortunately I won’t be in Germany yet for this event. I’ll be flying into Munich from on September 10th. Oh how sweet that your get to visit Cocoa and her carrying “parents” I am sure she is in the right place. Would you please provide us as readers with pictures of the kitten? Enjoy the Swiss Alps in it’s Beauty. Cornelia, perhaps you can enjoy the Ludwigsfeuer another August then. :) We will undoubtedly be sharing photos from our time in Ticino, Switzerland, visiting our new friends/Cocoa’s extraordinary family. We’ve just left there after 6 special days together, and I was touched by how well Cocoa is being taken care of by his family. To say he is living like a prince is an understatement. What a lucky and handsome cat! Thank you Tricia, can’t wait to see images of Prince Cocoa. Enjoy your time in Switzerland, make sure you get enough of their famous chocolate. Tricia, a little chocolate every day is just the most wonderful nutrition, that’s how I look at it. Thank you for your respond, enjoy your summer. Oh, and Prince Cocoa’s most recent pictures are now on Facebook! Wow! Fantastic – I recently traced some of my ancestors back to Bavaria and hope to visit one day! Travelscoutadventure, I also enjoy tracing my family roots, and along with ties to France, Lithuania, England, Norway, and Austria, I have family from Germany, and specifically Bavaria. Did you use any specific sites to do your research, and do you know what part of Bavaria they came from? Here’s hoping you’ll get to Bayern soon! I actually found a family bible that recorded my ancestors back to the 1700’s – with that information I used ancestry.com where I found the Bavarians. There were a handful from the Swabia region and a few from the Upper Palatinate specifically Regensburg. What a lucky find! So far we haven’t had the fortune of finding the family lineage all jotted down like that. Were you able to find any other people researching your family, so that you could ultimately connect with distant cousins in Germany? We’ve found that to be one of the most fun aspects of doing genealogy, even if we might be something like “7th cousins a few times removed” with the distant family we eventually meet. Have been aware of the Passion Play but not the bonfire tradition. What a sight to see. Hi Lynne, surprisingly, I don’t think the event is marketed much. Two years ago, when it was one of the bigger anniversaries of the Ludwigsfeuer, they did post some signs in the town, but I don’t recall having seen any this summer. I might have overlooked them, though. Unfortunately, we’ll miss tonight’s bonfire, as we are out of town. I know my parents will give me the full report though! This is such a fascinating post, something I had never heard about ~ but the photos and history you have written about and shown makes me take a shine to King Ludwig II, what a great time it looks to be. At I think I could also enjoy a nice Bavarian beer or two… The photos of the fire, torches create a great effect in the night, what an experience it must have been. Randall, if it’s beer you fancy, you’d be in great company the night of the Ludwigsfeuer, either drinking at a local’s informal get-together, or in a pub ’til the wee hours of the night. I used to enjoy the occasional beer myself, before my gluten-free days. True beer enthusiasts would likely cringe to hear that I favored Radler. It’s a 50/50 blend of sparkling lemonade and beer. :) Prost to you! I felt some sympathy for King Ludwig after visiting Neuschwanstein and hearing of his unhappy childhood. It’s nice to know he is remembered in such a beautiful ceremony every year. Carol, within the past years I’ve heard of several books written about King Ludwig, and I wonder if they might interest you? One was a novel, another a biography. (I haven’t read them, but do recall seeing something about his less-than-fairytale-childhood.) Did you get a chance to visit his Schloss Linderhof too? I haven’t been inside that palace for a while, but one of its outlying buildings contains a grotto structure in which the king was rowed over the lake in a golden swan boat. Schloss Linderhof is close to Oberammergau, and I think historians guess that this proximity, coupled with his Passion Play attendance, strengthened the bond between Oberammergau residents and Ludwig. We didn’t get to Schloss Linderhof last time. I will look up the books. I’m sure legend and truth are somewhat different. Thanks Tricia. We’re also curious to see his Herrenchiemsee Palace and Nymphenburg. It’s incredible how much money was devoted to such structures! I’m glad to hear you like the format of the articles, James; thank you! I apologize for my escargot-paced reply, but we’ve been settling in following our travels through Northern Italy and Switzerland. Knowing how you and Terri enjoy traveling to Europe in the early autumn, I think you’d like Oberammergau that time of year. 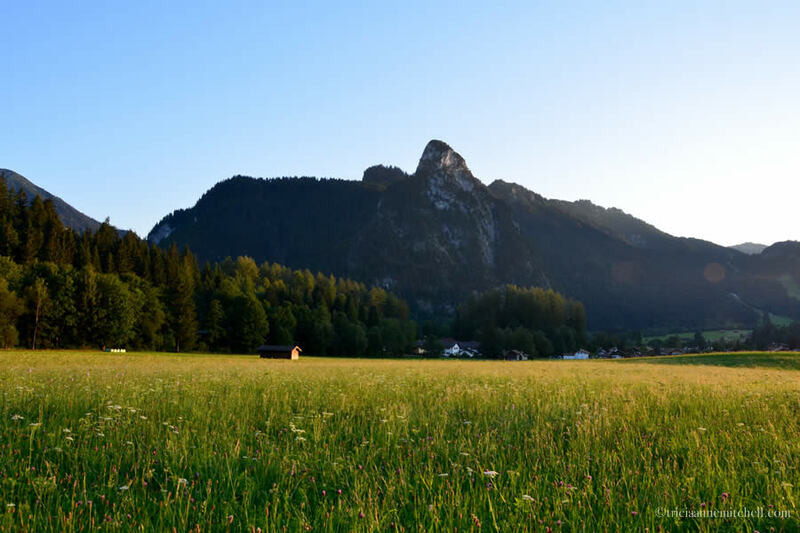 So long as it’s not raining (as it has been these past days – ahh, we miss the sunshine) September is a splendid time to hit the hiking trails around Oberammergau. Wish you safe & fun travels to the Balkans!